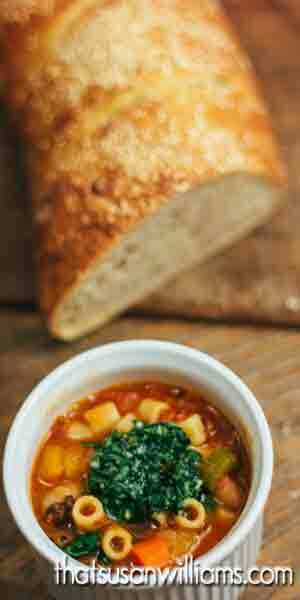 Minestrone with Pesto and Garlic Bruschetta is such a great soup for the colder months! 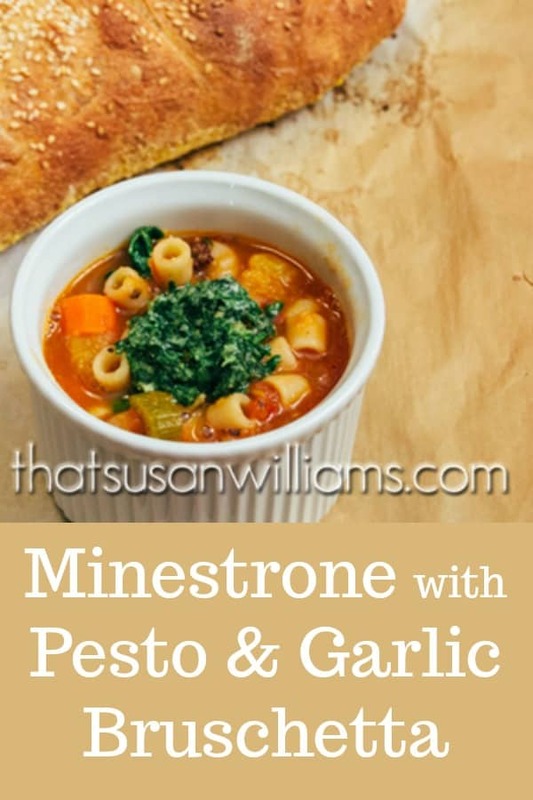 Winter hasn’t QUITE given up the ghost in these parts, so how about a delicious soup, packed with vegetables to nourish your body, beans for heartiness, pasta to comfort your soul, and bacon to add that sumpin’-sumpin’ that only bacon brings: that salty, smoky bit of pig-candy our mouths love so well! 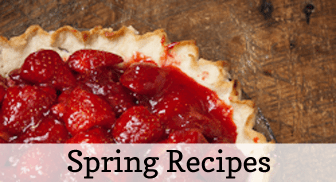 I found this recipe in my Ina Garten Barefoot Contessa Foolproof cookbook, and adapted it for the ingredients I had available in my pantry and fridge. It was fantastic, and I’d happily make and serve it again, and again. If you decide to make this, you will NOT be disappointed! 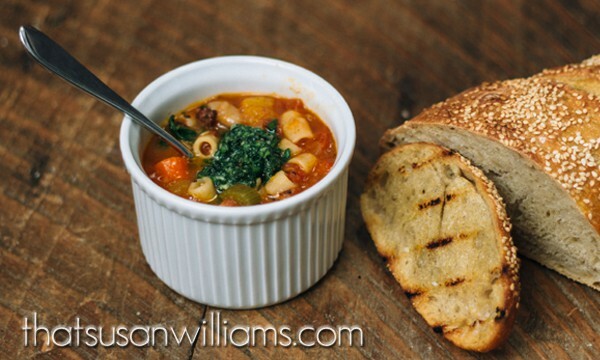 Here are the adaptations that I made to Ina Garten’s minestrone recipe. The first two require extra bits of work. I feel those extra efforts add so much, but you can avoid or ignore them, should you so desire – especially if you’re low on time and energy! 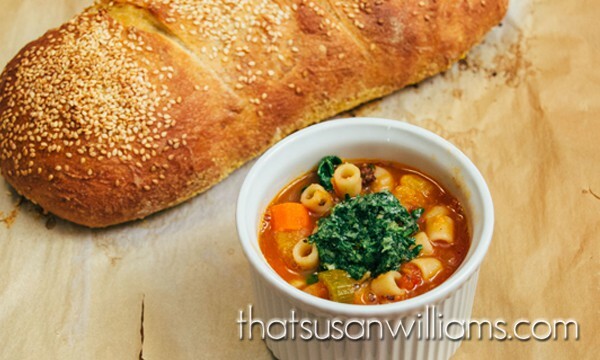 This is the best soup you haven’t (yet) made this winter! Stirring the fresh spinach into the soup. The pesto adds bright, vibrant color, and tons of flavor. A loaf of homemade Sesame Semolina Artisan Bread doesn’t hurt. First, I used homemade chicken stock . I have a recipe for how I make mine, here. 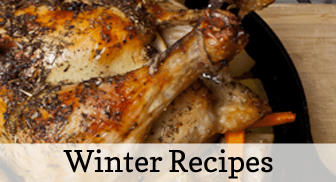 If you prefer to used boxed or canned chicken broth, that will work fine. It won’t taste quite as good as homemade, but it will be fine. Every time I have a couple of chicken carcasses, I make a batch of chicken stock, and store it in the freezer in 4 c. portions, so that it’s there when I need it. Second, Ina used store bought pesto. You can, if you like, ignore the pesto step altogether. 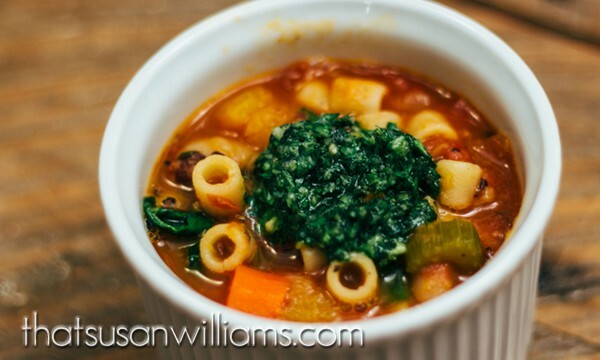 It’s a perfectly delicious soup without the pesto. I added the pesto, and I loved it. It brought a richness that I found quite satisfying. But it’s not NECESSARY, in order to enjoy this soup. Ever the over-achiever, I made my own pesto. Here’s the recipe I used: I think I actually made about 1/4 of the recipe. I didn’t have much basil (it’s not summertime!) so to add more green stuff, I threw in some spinach that I wasn’t going to use in the soup. That worked great. As long as we’re gilding the lily, you can make your bruschetta out of homemade bread, like I did. Third, for the bruschetta, I used my own recipe for Sesame Semolina bread. That’s a little (OK…that’s WAY) over the top, but if you like to bake bread, you won’t believe how easy this recipe is for artisan bread. Ina called for pancetta, but I didn’t have that, so I used bacon, which was great. Ina called for a special kind of tomatoes (Pomi) that I didn’t have, so I just used regular canned diced tomatoes. 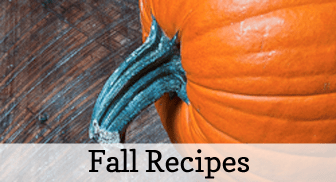 Ina called for butternut squash, and I used that, but I think you could substitute diced potatoes, too, or sweet potatoes, if your family might prefer that. Ina called for tubetti pasta, but I used ditalini, which is a small pasta that is kind of like shorter tubes of elbow macaroni. But you could use any other kind of small pasta. Finally, I doubled the amount of cannellini beans that she called for, just because we like them. Love that vivid green from the pesto, plus, it adds so much flavor! 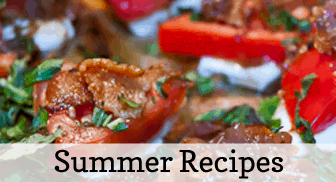 IF YOU LIKE THIS RECIPE, WON’T YOU PLEASE PIN IT ON PINTEREST? 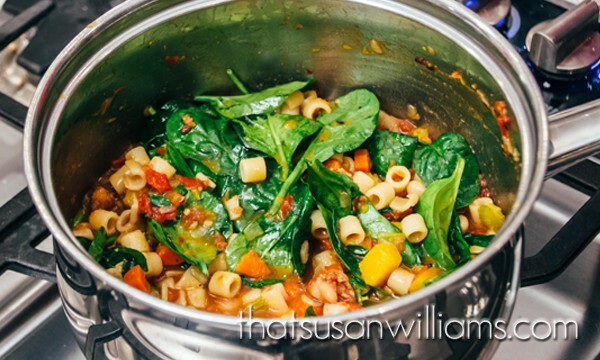 A delicious soup, filled with vegetables, beans, bacon, and pasta. Just to gild the lily a bit, top with pesto, and serve with garlic bruschetta. Heat the olive oil in a Dutch oven. Add the chopped bacon, and cook over medium low heat for around 6 minutes, until bacon is lightly browned. Add the onions, carrots, celery, squash, garlic, and thyme, and cook over medium heat for about 8-10 minutes, until the vegetables begin to soften. Add the tomatoes, chicken stock, bay leaf, 2 t. of salt, and 1 t. of pepper. Bring to a boil, reduce to simmer. Simmer for 30 minutes, until the vegetables are tender. Discard the bay leaf. Add the beans and cooked pasta, and heat through. Soup will be quite thick. Just before serving, add in spinach, and toss with a spoon. Cook a few more minutes, until spinach is wilted. Stir in white wine, and 2 T. of pesto. Taste, and adjust seasoning, adding more salt or pepper, to taste. Top each bowl with a small dollop of remaining pesto, and serve with garlic bruschetta on the side. Heat a cast iron grill on stove top. Slice the baguette at a 45º angle into 1/2" slices. Brush both sides of slices with olive oil, and grill until lightly toasted. Remove from grill, and rub the surfaces of each slice with the sliced garlic. Ina Garten's recipe called for pancetta instead of bacon, so that's an option, but I had bacon, so bacon is what I used. My soup was fabulous. Ina also called for store-bought pesto. I can't abide store-bought pesto, so I made my own with basil, parsley, and some of the remaining spinach that I had. Deelish! 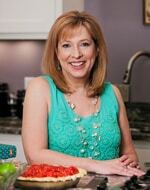 See the recipe for fresh pesto here on my blog. I doubled the amount of cannellini beans, because we love them, and I wanted a nice, hearty soup. If you can't find ditalini (small pasta) use whatever you can find. Stars might be nice!